The remarkable aspect of Magda Giannikou’s musicianship is not that she can play almost any instrument, but it is that she is a remarkably talented singer who has absolute pitch. She has an angelic voice and she usually sings with a puckish, child-like sense of wonder, but when she sings songs such as “Fever,” the one that made Peggy Lee famous, she becomes alluring and sensuous, and a vocalist with a strong sense of herself. Lines rise, then fall like misty sighs cascading from her lips as she sings with breathtaking fragility. While “Fever,” recorded by the legendary impresario and percussion manufacturer, Martin Cohen at his private studio appears only on You Tube, the music performed on Ms. Giannikou’s debut record, Amour t’es là by her working ensemble, Banda Magda, is wonderful; the work of an artist who must be received with joy and considerable awe for the monumental vocal talent that is on show from a woman who plays several instruments and sings in French as if she were a local Parisian chanteuse. As the name of the ensemble suggests, Banda Magda is a group of musicians who are enamoured of Brazilian choro and samba and other folk forms. However, apart from employing percussion in the grand Brazilian manner, Ms. Giannikou and the group sometimes use such devices resplendent of larger orchestras such as string and brass counterpoint; and the vocal harmonies give notice of the complexity of some of the arrangements. If at first the French vocals set against a backdrop of Brazilian rhythms seems strange, this soon disappears as Ms. Giannikou alluring voice takes over. 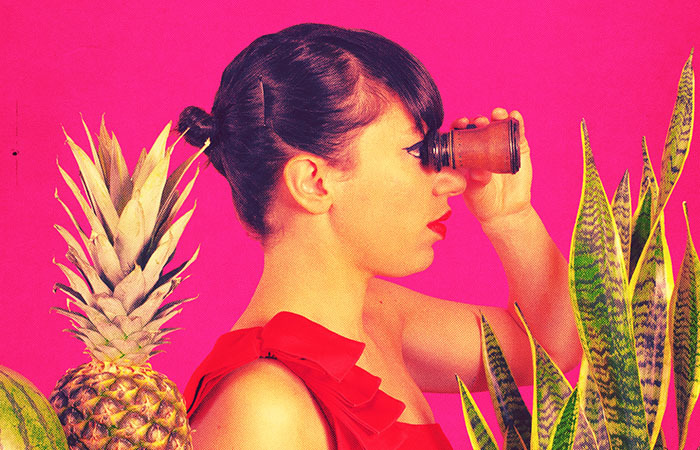 “Amour t’es là” is a classic example of the seamless melding of rhythms from that South American country and a European sensibility that appears out of truly authentic French vocals. The remarkable percussion break by Marcelo Woloski only serves to reinforce this view. The hand-claps and other rhythms on “Couches-toi” that subtly blend into the bossa-nova-like feel of the song appear to be like homage to the late style of Antonio Carlos Jobim music. “Juin,” might suggest a composition fusing deep choro with the music devised by Chico Buarque in the elegiac beauty of its arrangements. This does not mean to suggest that the music on this record lacks originality. In fact nothing could be further from the truth. It is actually the warm and embracing gentility and gush of notes from Ms. Giannikou’s accordion that gives her music its unique character. “Fond de la mer” is one of those songs and Max ZT’s hammered dulcimer is a wonderful fit for a song such as “La Japonaise”—a northern English instrument on a song that is essentially a Japanese musical excursion would seem obscure, but actually works exquisitely. 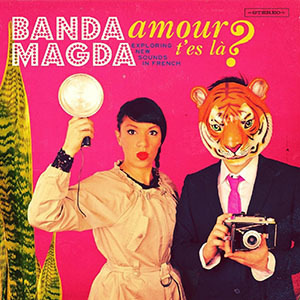 Another wonderful chart is “Mouche,” a chart that swings dramatically between pantomime and balletic pirouettes that characterise the best work produced by Banda Magda. The musicianship on the album is of the highest order. Ms. Giannikou is technically outstanding on her accordion and piano, and Mr. Woloski has gorgeous touch no matter what rhythmic idiom he is quoting from and no matter if he is playing cajón or any other musical instrument. The bassist Petros Klampanis has a sublime, melodic sense that adds much melodic and harmonic excellence to each and every chart. Mika Mimura’s vibes are played with immense control and subtlety following the lead of Ms. Giannikou’s voice, which is not only child-like at times and adult and sensuous, but can, as “Petite Maline” suggests can also handle complex emotions such as melancholia and that absolutely indescribable Brazilian emotion: “saudade”. And in the end this wonderful chart bodes well for Banda Magda and Magda Giannikou herself, who—although not included on this album—has also given evidence that she can handle Portuguese as well, Perhaps there is room for another remarkable album from this excellent new ensemble. Track Listing: Amour t’es là; Astéroïde; Caramel; Ce Soir; Couches-toi; Juin; Fond de la mer; La Japonaise; Mouche; Oublies-la; Petite Maline. Personnel: Magda Giannikou: accordion, voice, piano, guzheng; Ignacio Hernández: nylon string, acoustic and electric guitars; Marcelo Woloski: percussion, kalimba; Petros Klampanis: double bass; Mika Mimura: vibes, marimba, glockenspiel; Keita Ogawa: percussion; Michael League: electric bass, baritone, electric and acoustic guitars, vocals; Justin Stanton: Fender Rhodes, Hammond B3; Jordon Perlson: drum set; Chris Bullock: flute and clarinet; Mike Maher: trumpet and flugelhorn, vocals; Jay Jennings: trumpet; Davindar Singh: baritone saxophone; Dan Pugach: percussion (1, 4); Max ZT: hammered dulcimer; Maria Im: violin; Robyn Quinett: violin; Lev Liova Zhurbin: viola; Jody Redhage: violoncello; George Kontrafouris: piano (2); Dimitris Sevdelis: piano (10); Samuel Torres: congas and hand guïro (10); Jonathan Singer: tabla; Petron Kourtis: percussion (6, 7); Sumie Kaneko: shamisen; Ricardo Vogt: (1, 4); Eric Kurimski: guitar (7); Alexis Julliard: background vocals; Kimi Lundi: background vocals; Sylvie Bourban: background vocals; Anna Talpe: background vocals; Melodie Tyler: background vocals; Marcelo Woloski: background vocals; Jeremy Loucas: background vocals; Juan André Ospina: background vocals; Lindsay Oesch: background vocals.